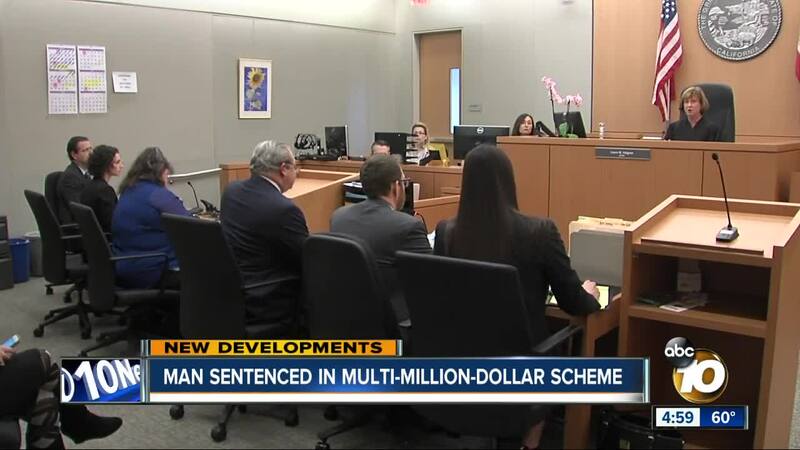 SAN DIEGO (KGTV) - Victims of a multi-million dollar investment scheme cried in San Diego court Friday as the man who pleaded guilty to elder theft learned his sentence. Jacob Cooper, who once ran Total Wealth Management, made a plea deal admitting to three counts of making a false statement in connection with the sale of a security, and one count of elder theft. He originally faced 19 felony counts, including conspiracy, elder theft, and making false statements. Prosecutors said Cooper quietly accepted referral fees in exchange for placing clients’ money in certain funds. A judge ordered Cooper to spend five years in prison after hearing from some of his elderly victims, who said his punishment was not enough for the $7 million they lost. 11 of Cooper’s victims appeared in court Friday. "No idea of the nightmare we would experience,” said retired emergency room physician Dr. Byron Mitchell. He and his wife, a nurse, lost more than $1 million. “We are haunted each day. My wife has bone cancer but still works to make ends and she's sick,” said Mitchell. Cooper, a father of five, said he is a deeply religious man who was duped by fund investors. “Things did go wrong, it's true, but I believed the investment opportunities were good,” said Cooper. Cooper mouthed the words “I love you” to his wife while he was led away in handcuffs. As part of the plea, Cooper paid back $20,000 to each of the victims. He is also required to pay back the $7 million he fraudulently invested.